Universal Music Group, in partnership with YouTube, was seeking a strategic partner who could design, execute, and deploy an interactive media platform for premium music video content online. 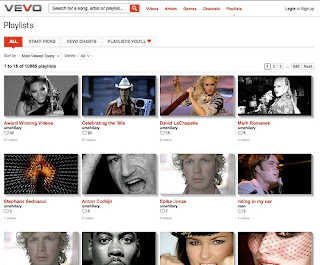 This service, known as VEVO, would generate new revenue streams for content creators, and provide brand advertisers unprecedented access to a highly engaged audience. UMG selected Possible Worldwide (formerly Schematic) based on the company experience in building best-in-class online video destinations, such as the site for the 2008 Beijing Olympics. Adopting an agile approach to the build, we put together a multi-disciplinary team of 35 people from our offices in New York, Los Angeles and Costa Rica to work with third-party vendors (including Baynote, FreeWheel, YouTube, Vivendi, Crowd Factory, and Parse3) to design, develop, and deploy VEVO in just over 5 months. In its first three weeks, VEVO pulled in more than 35 million unique visitors, becoming the most visited music network in the US for that month. Blending UMG’s broad catalog of top artists and content with YouTube’s leading edge video technology and user community, it now does for music videos what Hulu has done for television and movie programming online. Sony has also recently signed on to the effort and will contribute music video content from its vast library. I was co-leading the .NET backend development team in charge of implementing not only the user facing site but also the content administration tool. The work involved a deep level of architecture work to make sure the site was able to scale in time to support the vast amount of user traffic that was foreseen.